【Convenient to Use】 2 or more radio models of this kind can work together as long as you make sure they are under the same channel. With a simple push-to-talk operation, let your children experience unprecedented happiness. 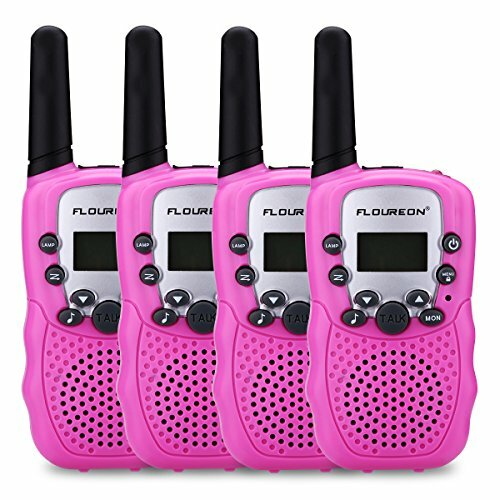 【Long Range】 FLOUROEN 4pcs radio sets with 8 channels, transmitting and receiving icons for communication. Generous range up to 3km in open field. (4*AAA Batteries Not Included). 【Flexible Application】 Great for supermarkets, shopping centres, festivals and any outdoor/indoor activities. Best birthday Chirstmas present for your kids or families. Safe for Children to enjoy the most beautiful outdoor time by using FLOUREON walkie talkies. 【Main Features】 Good sound quality with Adjustable volume level and Fast to find an open channel with auto channel scan. It has LCD backlit display, battery status indicator and Built-in mini LED torch. Great walkie-talkies but one is faulty .